The newly-unveiled Skyrim Collector's Edition features a foot-tall statue of Alduin and a price tag that's even bigger. The question was never whether there'd be a Collector's Edition of the upcoming Elder Scrolls V: Skyrim, but what Bethesda would cram into the box to make it a must-have for fans. 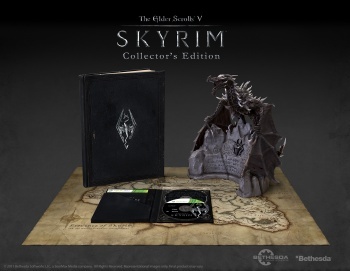 And now we know: along with the game itself, the Skyrim CE will include a huge, 200-page Art of Skyrim coffee table book, a "Making Of" documentary DVD with interviews, behind-the-scenes footage and more, and the piÃ¨ce de rÃ©sistance: a 12-inch-high PVC statue of Alduin, the World Eater, perched atop a wall inscribed with the ancient language of the dragons. This is sweet stuff indeed for any serious Elder Scrolls fan but it doesn't come cheap. The Skyrim CE boasts a Nord-sized price tag of $149.99 in the U.S., €149.99 in Europe, Â£129.99 in the U.K. and $199.99 in Australia. Yowtch. Bethesda says the Collector's Edition will be available in "extremely limited quantities" so in spite of that hefty sticker, it probably wouldn't hurt to get a move on with the preorder if you're interested in this beast. The Elder Scrolls V: Skyrim comes out on November 11 for the PC, PlayStation 3 and XBox 360.